This package includes everything from start to finish depending on your current knowledge of fishing, from how to use a spinning rod (which I will provide) and the knots I use to reading the river and what lures to use under certain conditions and how to fish them correctly. There is much more personal instruction and less guiding on instructional trips. The rate for Package #1 is $335.00 and includes lunch. Package #2 1/2 day or 4hr instruction for one or two adults. No time for a full instructional trip? This trip is given given from 4:00PM to 8:00PM . Again it's more instruction and less guiding. 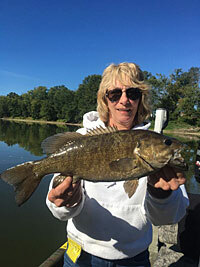 We will cover the basics of river fishing from proper use of a spinning rod to proper techniques and reading the river. I will teach as much as I can in the time allowed. The rate for this trip is $235.00 and includes bottled water and a snack. Package #3 a 3hr instructional trip for one youngster age 6 to 12, and one parent. This trip is given from 4:00PM to 7:00PM. Kids are our future and I love teaching kids how to fish properly and the need to respect nature and conserve it's resources. We will start with how to cast a spinning rod. Then how to use the basic lures of fishing. I make it fun for kids with rewards for catching and learning along with just having fun and a prize at the end of the day. All children age 12 and under must wear a PFD at all times under PFBC law. The rate for youth instruction is $155.00 and 1 parent can fish along also if they have a license. Snacks and bottled water will be provided. From ice out March 1st to April 1st I offer a 6hr charter for up to two people at a rate of $195.00. This traditionally starts at 10:00AM and goes to 4:00PM to get the warmest waters of the day. Also from Nov 20th to ice in Dec 20th, I offer a 6hr charter for up to two people at a rate of $195.00. This traditionally starts at 9:00AM and goes to 3:00PM to get the warmest waters of the day. Note: If you want longer or shorter hours than the special, regular rates apply!